The biggest annual MV event in western North America is coming to a NEW VENUE April 16-21, 2019! 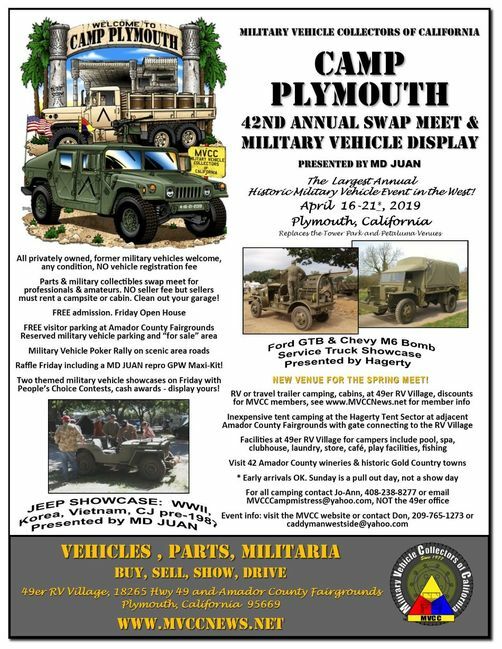 The Military Vehicle Collectors of California CAMP PLYMOUTH 42nd ANNUAL SWAP MEET & MILITARY VEHICLE DISPLAY Presented by MD JUAN will descend on the 49er RV Village and Amador County Fairgrounds in Plymouth, California, 18265 Hwy 49. This is across the Central Valley from Tower Park, northeast of Lodi and east of southern Sacramento. This is Gold Country, 29 miles from where gold was discovered at Sutter's Mill in 1848. Many historic frontier towns are along Hwy 49 and Plymouth is the "Gateway to Shenandoah Valley Wine Country." This event will likely be bigger than it's annual Spring predecessors going back to the late 1970s: Camp Petaluma, Camp Delta at Tower Park, the Big Bear Meet, and the Patterson Rally. It solves all issues we had for two years at Petaluma KOA, and problems with Tower Park rules that will keep us from returning there. The 49er RV Village is large, we have a big block of sites with expansion room. There are practically an unlimited number of tent sites at the adjacent Amador County Fairgrounds which the MVCC has rented. MVCC members receive camping discount at 49er which more than pays for your $35 12-month membership ($25 for electronic monthly newsletter). See application on our website. All welcome, anywhere. Jo-Ann Lesser is again our "Wagonmistress" assigning sites. Contact her for questions or for a site at MVCCCampmistress@yahoo.com. 49er office does not assign sites. She will tell you when to contact the office to put your one-night deposit on your RV site. March 1 is deadline if you have not done this, or your site becomes available to others. Tent site rental at the Hagerty Tent Village must be paid to the MVCC in full prior to arrival to reserve space - ask Jo-Ann for information. MVCC is renting the fairgrounds. Annual fundraising Raffle - includes one MD JUAN replica WWII Ford Script jeep Maxi-Kit! $7,000+ value! Many amateur sellers - time to clean out your garage and closet! JOIN US FOR THE BIG ONE! Last edited by Major Asstyrd; 02-05-2019 at 19:25. I posted some new links to photos of the kit. Last edited by Major Asstyrd; 03-27-2019 at 16:54. Does anyone know if the camping area has fire pits? Can you have an open fire? I’ll be camping and am trying to figure out what all to bring and how I’m going to cook. Mik, fires authorized in raised pits only at the Hagerty Tent Sector at the fairgrounds. Not on the ground. You have to bring it and wood. At the 49er RV Village same thing but they want to sell you their wood. Last edited by Major Asstyrd; 03-05-2019 at 14:27. Mike, how many days are you going to attend? Due to the 49er rules on soft top campers my (M105A2) with canvas cover will not be allowed in the camping area. So I have been banished to the fairgrounds and will have to pitch a tent. I bought the S250 Shelter in November, but the weather here has been in the 30s & 40s so I haven't had a chance to get it mounted in the M105A2, and set up for camping. I asked JoAnn if I can get my old spot back in the camp ground when I have my S250 shelter's finished for the Sept. meet. So for now I'm leaving the deuce at home, and I'll just drive my Chevrolet pick up and bring the propane stove and ice chest. I haven't spoken to Alan & Randy yet to see what they have planned. Mike I'll call ya. Last edited by Tracer; 02-10-2019 at 09:56. Thanks for the info. I’ll bring chairs, table and Camo netting for shade. Since I have a water and power site, I can see me making use of my electric hot plate. Tracer, why not bring the big truck and camp in it at the fairgrounds? If it rains you might want a place to hide out in that's not a tent. Put out a tarp roof next to it? Also you can putt around with it to both sides of the event whenever you want, and take it on the MV Poker Run and the run on Saturday afternoon to Knight Foundry that Tim Coolbaugh is putting together. 19th century water powered foundry and machine shop. One option is sharing a site in the Hagerty Tent Sector and if no room for the rig, park it at a nearby display location and tent camp at the campsite. There is no charge for MV parking and other displays outside the numbered campsites at the fairgrounds if not camping in it. Bring some cones or signs saving the space while you are driving around. There will be an area at the fairgrounds for extra MVs or those driven in by commuters from hotels or home. Last edited by Major Asstyrd; 03-05-2019 at 14:33. Here is the current event flyer. I can email the file to people who want to pass it around to people who might not see our info. Let's get some participants, we have the room! Click to enlarge for reading or printing. Pass the word! Last edited by Major Asstyrd; 03-27-2019 at 18:21. Now THAT is cool! It's 8 miles from my house! I have volunteered at the steam powered saw mill there before.